Our idea for today was to get into our rented car and drive to the “Pueblos del Sur”, a chain of small villages along a road crossing the mountains south of Merida. These villages are way out of the touristic route, and still preserve their traditional colonial architecture. We later learned that the mother of one of Mayli’s aunts was born in one of these villages. 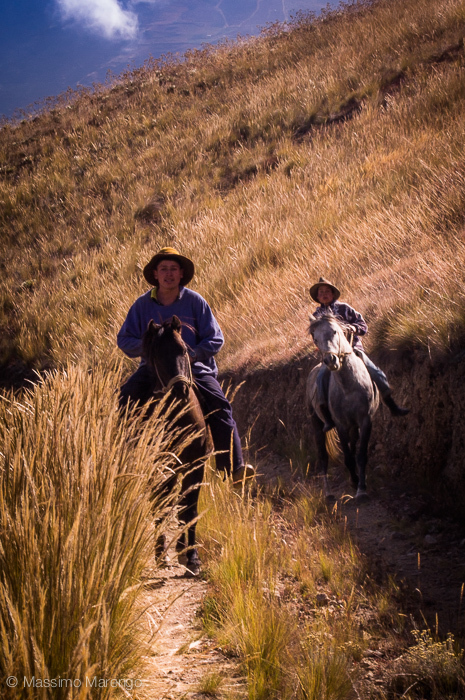 At that time the village was only reachable from Merida after a two day horse ride along a steep mountain path. Mayli’s aunt father only made the trip twice: after the second trip along the grueling path he decided that this was too hard. He eloped to Merida with his sweetheart and they got married. We too had to give up before even starting, the conditions of the road were still too rough for our Fiat Uno. So we decided to drive along to the road of the Paramo. The Paramo is a high altitude (12,000ft) grassland ecosystem unique to the Andes of Venezuela, Colombia, Peru and Ecuador. The Paramo is very beautiful and rich of endemisms, species that cannot be found in any other places in the world. The road of the Paramo connects Merida with the plains of Central Venezuela climbing through valleys connected by two high mountain passes, one of which is called Pico del Aguila, and is over 4,000m (12,000ft) on the sea level. That was our destination. Once we reached Mucuchies (which is the village where Mayli’s grandfather was born), we however took a detour towards a remote village nested in a secondary valley where Mayli had been many years ago. The problem was that Mayli didn’t remember the way, nor the name of the village. However the people living in these mountains are really nice, and we managed to ask our way around even with the few memories that Mayli had of the place. The little village, Gavidia, is indeed set at the end of a long secondary valley, reachable with a paved road climbing through a spectacular gorge. After the gorge the valley opens up again, with the village spread in its middle. As far as I could tell the village is populated mostly by farmers and herders of native origin. Along the way we had been stopped innumerable times by little kids asking for change, for the “año viejo”. This is a typical tradition of the Andes, in which kids build a puppet made of straws (the "año viejo) that is set on fire on new year’s eve. They place their año viejo on the side of the road and ask for money at the passing cars. As you can guess we soon ended without any change left, well before reaching Gavidia. Once we arrived at the village (and after Mayli took the ritual photo of the local “mercal” - read this previous post for explanations) we drove back, following a red truck with three little kids playing peek-a-boo with Mayli as she was trying to photograph them. After Gavidia we drove back to the main road, towards the astronomical observatory, and then to the Pico del Aguila pass. There, we took another secondary road to Piñango, another semi-isolated village. We had been in Piñango a few years ago, and it was definitely too far for today, as sunset was already approaching. 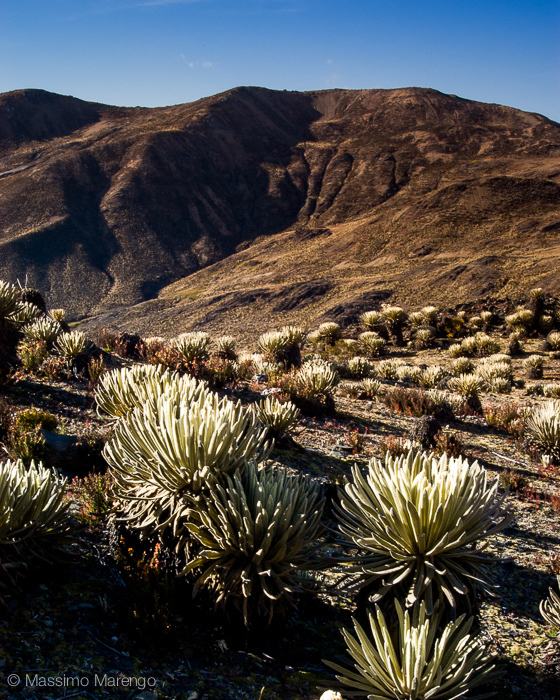 However, just driving for a few kilometers along the road was enough to enter a highland filled with frailejones, a dry climate plant endemic of the Paramo. The photos above and below were taken there. The name frailejones (“big monks”) derives from the fact that the plant at a distance looks like a monk walking in his robe. The most amazing characteristics of the frailejones are their furry leaves, that remind me of rabbits ears. After filling one full 512MB card of pictures of frailejones we drove back to Merida, where we arrived when it was already dark, after stopping again in Mucuchies for dinner. This was probably the last time Mayli and I managed to escape from the beaten path and travel alone in some remote area in Venezuela. In part this is because work commitments makes it impossible to stay long enough in Venezuela to actually have time to explore, but another reason is that the country is less safe for travel (even though the villages in the Andes are still the safer area to be). You can check out the two kids hiding in the truck on my instagram feed.